Non-political ads and publishers are being affected by the new rules. Last month, Facebook launched its new political ad policies, which require ads to say who paid for them and those purchasing ads to go through a verification process. The rules are meant to prevent some of the problems that occurred during the 2016 US presidential election, during which Russian groups purchased Facebook ads with the intent of sowing political discord. But while the more rigorous process seems like a step in the right direction, it has come with a few issues of its own. Some of the problems aren't terribly surprising -- new guidelines are sure to cause some growing pains especially since many political campaigns are already well underway throughout the country. 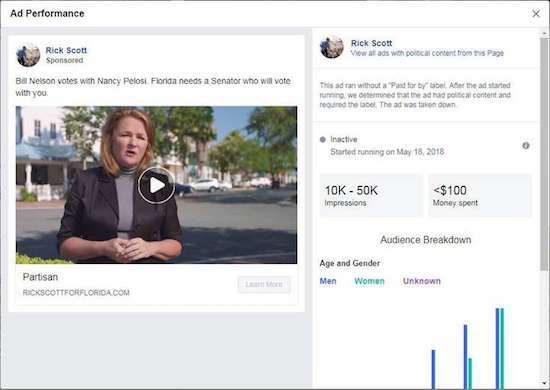 The Tampa Bay Times reports that over a dozen Florida candidates, including Governor Rick Scott, candidate for governor Chris King and Representative Ron DeSantis have had their ads taken down since the new policies were put into place. And many of the ads in question, some of which were posted before the new rules took effect, were removed because they didn't properly specify who paid for them. But other issues aren't just consequences of adjusting to new regulations. 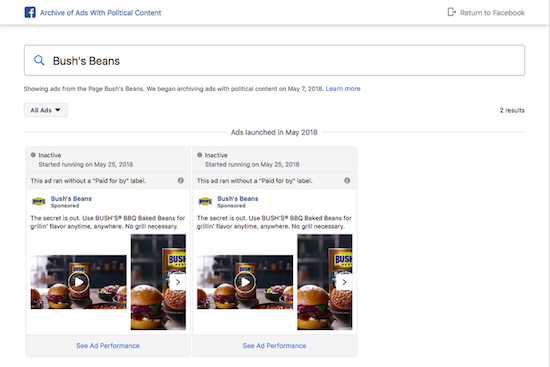 Instead, they appear to be snags in Facebook's political ad-recognizing systems as well as pitfalls stemming from a purposefully wide scope as to what qualifies as a political ad or issue. An ad for a podcast featuring an interview with the author of a new book about Russian media coverage of Donald Trump, a promotion of an article on the Flint water crisis and one for a report about a pro-law enforcement license plate have all been removed by Facebook for violating the new policies, despite not being political advertisements. But while these removals seem like accidental casualties of a system that's still being tweaked, Facebook's policies are actually meant to pick these posts up by design. Though ads for candidates running for public office are naturally included in the new political ad policies, so are ads that relate "to any national legislative issue of public importance." And those issues include the military, the environment, budget, crime, civil rights, guns, taxes and a number of other broad categories. "When you want to give people more information about political content, the obvious question is what do we consider 'political?'" Katie Harbath, head of Facebook's global government and elections effort, said in a Facebook announcement last month. "The answer might seem to be that ads that advocate for a certain candidate or cause, but just looking at ads on either side of a candidate race would not go far enough. And after making that initial announcement in October, we heard feedback from a range of independent stakeholders and third parties that we should also include issue ads or ads about important topics being discussed across the country." However, there have been some head-scratching removals including ads from the Florida Department of Highway Safety and Motor Vehicles, Bush's Baked Beans, restaurants, a cat rescue organization, a winery and apparel stores. "Enforcement is never perfect at launch, but that's why we have processes in place for people and advertisers to help us improve," Rob Leathern, Facebook's director of product management, told The Verge. Those very well could be side effects of a system that still needs adjusting, but of concern is how the new policies are affecting publishers. The Verge reports that publishers like Vice News, Vox, the Asia Times, Brut, NowThis, Business Insider, Newsmax, the Washington Examiner and Melville House have all had ads and promoted posts taken down. Ahead of the implementation of the new policies, the News Media Alliance, which represents some 2,000 news organizations, sent Facebook a letter, calling the rules "problematic" and saying, "Your plan to group quality publishers alongside political advocacy, which the ad archive will do, dangerously blurs the lines between real reporting and propaganda. It is a fundamental mischaracterization of journalism that threatens to undermine its ability to play its critical role in society as the fourth estate." Some publishers are resorting to registering as political advertisers in order to get their promoted posts through the system. "We won't always get it right. We know we'll miss some ads and in other cases we'll identify some we shouldn't," Facebook said last month. "We'll keep working on the process and improve as we go." We've reached out to Facebook about the current problems with the new policies and we'll update this post if we hear more.